I don't mean yesterday's blue moon but a pair of Sharpless objects. I've started working on the AL Arp Galaxy program, and it suffers from a seasonal bias--external galaxies tend to be seen best when placed away from the plane of our own galaxy. The Bright nebula program had an opposite bias in that most nebulae are in or close to the plane of the Milky Way. 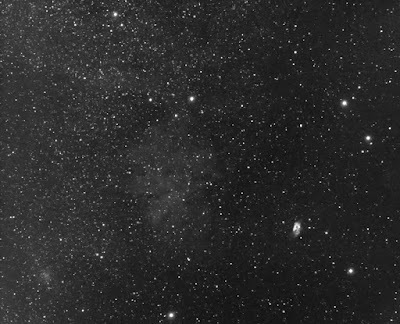 When the Milky way is well placed in the sky you're kept busy imaging nebulae; when it's not, you have almost nothing to do. The opposite holds for galaxies. Two examples: The BN list has 15 objects in Cygnus, while the Arp has only one; The BN has one object in Ursa major while the Arp has 34! The way to avoid the "hurry up and wait" problem is to do multiple programs at once, choosing programs that have complementary biases. So I think I'll also do the Planetary Nebula program (concentrated in the galactic plane) along with the Arp (concentrated at the poles). Here's an image for the PN Program. It's not my first; for that I'll have to look back through my old images. 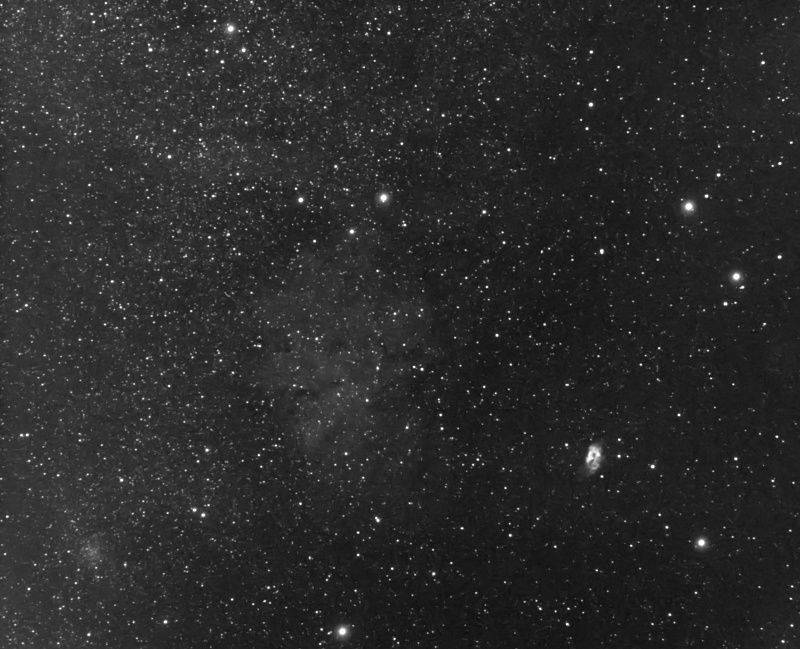 This one is Sh 2-71, very bright and sitting just west of a much larger and dimmer Sh 2-72. Sh 2-71 at right, the much more extended and dimmer Sh 2-72 at center left. This image is in H-alpha and is another illustration of the power of narrowband imaging. These objects were in Aquila and the full moon was in Aquarius, not very far away. The moon was up for the entire data acquisition time and I was imaging under a red zone sky as well. In other words, the sky was bright. Last night the unbeatable factor was clouds; a lovely clear night slowly went overcast as I was collecting O-III data. I had to settle for an hour of H-alpha. It's nice to know that even though we have no remedy for clouds, we can image deep despite the moon. What's Correctable in this Image?